Qualys today announced QualysGuard PCI 5.0, giving customers a simplified way to meet the latest Payment Card Industry Data Security Standard (PCI DSS) compliance requirements. It includes updates following new Approved Scanning Vendor (ASV) requirements released in March 2010, and a simplified user interface (UI) with workflows – helping customers easily and accurately detect security vulnerabilities, and efficiently remediate issues for PCI compliance. Click here to read the full news release. 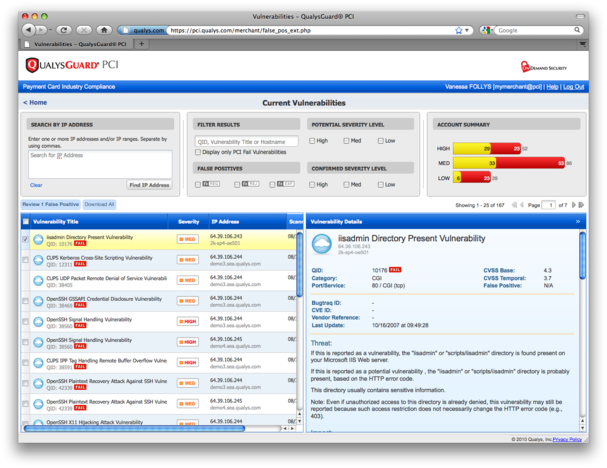 Visit the Qualys Community PCI page for more on this release, including a blog highlighting the new UI improvements, a video demo of PCI 5.0, and resources for more information.